This is one of our favorite trips close to home! Marianne is standing on top of the Bruneau Dunes in south-central Idaho. It's an amazing hike to the top and a surreal experience to walk the ridge of these massive piles of sand. You can see the RV campground in the distance across the lake. We love this getaway because it's only 75 minutes from the Treasure Valley, has relatively few visitors, and has lots of cool attractions nearby. The campground I give a solid B. The grounds are not great; the grass is not lush, it's a desert after all! But the facilities are nice (i.e. bathrooms, showers, hookups, small gift shop). Because the Bruneau Dunes are so remote (we're only 75 minutes from Boise but this is a sparsely populated state!) the stargazing is phenomenal! There is no light pollution to block out the stars, it's just great. They actually have an observatory here and guided stargazing events. The Details: Summers are really hot here, best to visit in the early spring or fall. If you're coming from the west, take Exit 90 (Hwy 51) off Interstate 84 toward Mountain Home, Idaho. Stay on this highway for about 50 miles until you junction with Hwy 78. Turn left (east) on 78 and you'll see the entrance to the park in about two miles. From the east, take Exit 112 (Hwy 78) off Interstate 84 toward Hammett, Idaho. Follow Hwy 78 for about 16 miles until you reach the entrance to the park. Sites here run about $20 - $31 for water, electricity (30/50 Amp), and/or sewer. Pads are gravel, 15 - 60 feet. Pets are welcome. If you’re traveling through southern Idaho on your way to the Great Pacific Northwest, or if you’re planning a visit to the greater Boise area, consider stopping over at Three Island State Park in Glenns Ferry, Idaho. This small, 600 acre park is just over an hour east of Boise and is a favorite destination for RVers during early spring or late fall. Three Island State Park sits on the Snake River in southern Idaho. It has a Visitor’s Center with information specific to the historic Oregon Trail, a picnic area, disc golf course, and short walking trails. About three miles of quiet roads in and near the park provide a leisurely bike ride if you’ve brought your cruisers with you. Nearby attractions include a great little winery called “Crossings” (formerly Carmella) which has a full bar with tastings daily and a fabulous restaurant. It also has an adjacent golf course and small RV park (in case the State Park is full.) Three Island is just a ¼ mile further down the road on the left. A small market in town (Southside Market) is right on the way and probably one mile from the park entrance. Best to set up camp and come back as RV parking is very limited. The Details: From the east, leave Interstate 84 at Exit 121 to Glenns Ferry. Turn right on the frontage road (old Hwy 30) and travel less than a mile to N. Commercial St., turn left. Follow this road until it makes a sharp right onto W. Madison Ave., another mile or so and the campground will be on your left. From the west, leave Interstate 84 at Exit 120 and turn right on N. Bannock St. After about a mile, turn left on the frontage road (old Hwy 30) and then right on N. Commercial St.; follow directions above. From either direction, the park is less than 10 minutes from the interstate. There are 81 maintained RV sites in the park. They're large and lovely with mature trees providing lots of shade from the hot southern Idaho sun. All sites have electric and water hookups but none have sewer. There are two dump stations that each can accommodate two RVs simaltaneously. There is no wifi connectivity either. Pads are 30’ – 60’, gravel, nicely spaced, and run about $35/night. Companion sites are larger and can host two RVs or an RV and support vehicles; these run about $55/night. The bathrooms are really clean and the showers have “hot” water (mostly hot, most of the time; we’ve stayed here many times and this has always been the case). However there are no paper towels to dry your hands so bring your own! Overall, we give the Three Island RV park a B specifically for location and cleanliness. If you’re venturing up near McCall, Idaho you’re probably staying a few days and already know about this little gem of the Gem State. The McCall RV Resort is a fantastic campground in central Idaho and, as the name suggests, this is an RV resort! It’s the extra amenities that make this RV campground a resort. Guests can use the large, rustic clubhouse to entertain in inclement weather or to watch the big game with friends. Some snacks, ice, and firewood are available for purchase. An indoor swimming pool and sauna welcome families all year and laundry facilities save you a trip to town. The property is very well-maintained, the bathrooms are clean and the water is hot. The changing rooms in the pool area were a bit untidy but we arrived on the heels of a large group of children and this may have had something to do with our observation. Walking paths wind through the wooded, hilly property and wildlife are frequent visitors to camp. Nothing frightening; fox and deer mainly but it reminds us to be thoughtful about leaving food and rubbish outside unattended or overnight. So, here is this lovely RV park and we haven’t yet discussed nearby attractions that make McCall such a special place to Idahoans. 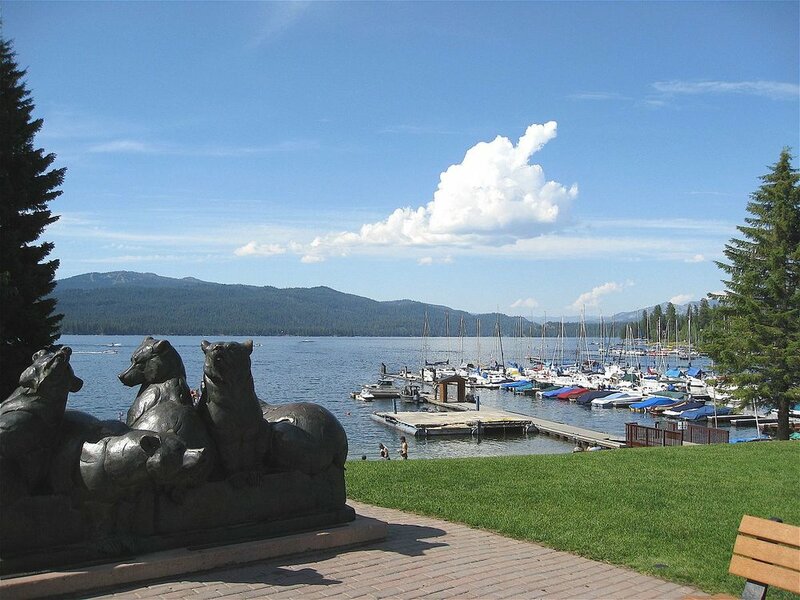 McCall itself has great restaurants and cafés, shopping and art galleries, and public spaces to enjoy all the activity on beautiful Payette Lake (the main attraction here). Sailing and kayaking, waterskiing and fishing, all are happening all the time on this busy mountain lake. Get away from the relative bustle of downtown McCall to hike or lay on the beach in Ponderosa State Park. Or drive 20 minutes north to Brundage Mountain Resort for skiing, hiking, or mountain biking (depending on season!). The Details: the McCall RV Resort is just 1 mile to the west of State Hwy. 55 as you pull in to the resort town of McCall. Turn left (west) on Dienhard Ln. and travel 8/10 mile to N. Mission St., turn left (south). In 2/10 mile turn right into the Northfork Lodge & Cabins & McCall RV Resort. There are 120 RV sites (with more to come) that are nicely spaced within Ponderosa pines and rolling hills. All sites here have power (30/50 AMP), water, and sewer. Pads include back-in and pull through sites; 35’ – 55’ long and range from $40/night to $65/night depending on the size of your site and the time of year. Wifi connectivity exists but is poor; cell phone coverage is good. With so much to do right in the heart of Idaho, the McCall RV Resort is a favorite for locals and travelers alike. We give it a rare, but well-deserved, A specifically for amenities, location, and ambiance.